Watch the highlights and hear from Development Manager Craig McRae after Collingwood's 44-point loss to Sandringham. Development Manager Craig McRae talks about Collingwood's loss to Sandringham. 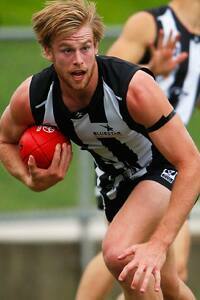 Jonathon Marsh was named Collingwood's best in Saturday's 44-point loss to Sandringham. An undermanned Collingwood side proved no match for Sandringham at Trevor Barker Oval on Saturday. The trip to the bayside suburb was anything but smooth sailing for the Magpies as they went down by 44 points in an extremely physical contest. Development Manager Craig McRae said the players were caught unaware after being “hunted” by a ferocious Sandringham outfit. “We went into the game with high expectations after some good performances in recent weeks,” McRae told collingwoodfc.com.au post match. “They hunted us and we took a couple of quarters to really get the game on our terms. After a competitive start, Collingwood allowed Sandringham to get on top in the second quarter as the home side added 13 scoring shots to just one behind. After a rev up from coach Dale Tapping at the main break, the Pies came alive in the third term, with goals to Adam Oxley, Caolan Mooney, Kyle Martin and Nick Gray cutting the margin back to 22-points at three quarter time. McRae said his side was “bullied” by the Zebras in the first half, with the home side placing a heavy tag on Collingwood star Kyle Martin. “We let him get bullied off the ball and around the ground and we probably took half the game to come to terms with that. In a side featuring familiar St Kilda names such as James Gwilt, Beau Maister and Shave Savage, the Zebras reclaimed composure in the final term as the heavens opened and scoring became increasingly difficult. While a final margin of 44-point proved relative to a contest largely dictated by Sandringham, McRae believes there were positives to be taken from the game. He stressed that the players were taught a lesson in how to “attack the opposition” before highlighting the performances of midfielder Ben Kennedy and full back Jonathan Marsh. “Kennedy is one that has really stood out in recent weeks,” McRae said. “And Jonathan Marsh continues to get better every week. He’s asked to play on the key forwards and he’s only played three or four games down back in his career, so he’s really standing up at the moment. At Trevor Barker Beach Oval.